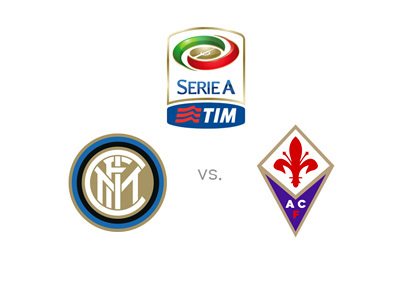 Inter are hosts to Fiorentina in the fifth round of Italian Serie A on Thursday, September 26th, 2013 at Stadio Giuseppe Meazza (San Siro) in Milan. Both Inter and Fiorentina are in good form so far this year. In Serie A, they are in third and fourth place, with three victories and one draw each. Inter are coming off an impressive 7-0 victory vs. Sassuolo and Fiorentina most recently beat Atalanta 2-0 away. Fiorentina had a blazing start to the UEFA Europa League campaign as well, beating Ferreira at home 3-0. Good news for Inter is that Diego Milito is back from a long term knee injury and he has already scored two goals in their last league match. Fiorentina will be without the ex Bayern Munich striker, Mario Gomez, due to injury, but Giuseppe Rossi is back in action for the team from Florence and has already scored five goals this season. Inter are the favourites. A 100 € bet on Inter could produce 90 € in profit, while the same bet on the visiting team could return 300 € in profit. The most likely score on Thursday is a 1-1 draw offered at 11/2 (bet 100 € for a chance to win 550 €). Diego Milito is the favourite to score for Inter at 21/20 (bet 100 € for a chance to win 105 €), and Giuseppe Rossi is the favourite to score for Fiorentina at 13/8 (bet 100 € for a chance to profit 162 €). Both teams are looking to prove to be worthy scudetto challengers on Thursday in Milan. Let's see how the game plays out.